We have hardwood floors, and since the dogs like to stay close to me, I toss an old blanket in the corner of my office for them to use. It gets scrunched, often into a pile big enough only for one or two of the three dogs. 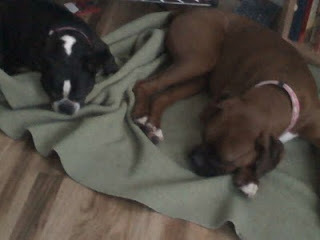 Daisy the Boxer is the puppy of the three, and the Boston female is the oldest of the trio. I've watched for years as the Boston female allows the Boston male to move her away from whatever food remains in her dish after he has gulped down his own. He doesn't force her away from the dish; he simply moves as close as possible and stares at whatever food remains. She never growls, never barks, never snaps; she simply moves away and allows him to finish. The Boxer is a talker. She moans, groans, rumbles whenever things are not as she pleases. Over the last few days she has taken to barking at whichever Boston (or both) is occupying the blanket on the floor. She can bark, bark, and bark, and the male Boston won't move. She can bark, perhaps for twenty or thirty seconds, at the female Boston ... who will then given the Boxer her place on the blanket. Today she gave Daisy the Boxer her spot, and then a few minutes later she quietly returned to rest at the edge of the blanket. The more I watch the pack behavior of the dogs, especially considering that the female Boston is appreciably older than the other two and considering she was an adult when they were brought into the house, the more I think about how they relate to the wolf pack hierarchy, albeit the wolf pack supposedly has a dominant female and a dominant male -- the largest, strongest, fastest -- but the Boston female is not that. She dominates by will.